In Zambia, men want big families, while women prefer having fewer babies. Policy-makers in this heavily populated nation want to lower the birth rate, particularly since the lifetime risk of dying in childbirth is one in 27, and having numerous children close together ups the risk. So, Nava Ashraf, a professor in the department of economics at the London School of Economics, ran a study with 749 low-income couples in Lusaka, the country’s capital. In one group, couples got a voucher for free birth control at a local clinic. In the other group, the vouchers were given to the women only, in private. The result? Those in the first group were 27 percent more likely to have a new baby over a two-year period compared to the second group – many of the latter got injectable contraception in secret. It seemed putting birth control solely in women’s hands works. Then Dr. Ashraf – who grew up in British Columbia – and her team did interviews with the women who received the clandestine contraception. “They reported being much less happy,” says Dr. Ashraf. The women knew they’d made the right choice for their health, but their husbands were upset when they found out. “They asked if there wasn’t a way they could change their husbands’ minds,” says Dr. Ashraf, who has since developed a new study to see how educating men about maternal health risks impacts birth rates. It may not sound like it, but Dr. Ashraf is doing economics research in a growing field called family economics. While her decades-long fieldwork in Zambia intersects with developmental and behavioural economics, it also falls squarely within this subfield that explores family negotiations and decision-making. “The basics of economics assumes there is a trade-off between two things,” says Ana Ferrer, a professor of economics at the University of Waterloo. Zambian women, for instance, chose their health over harmony at home. Family economics explores how families juggle financial and time trade-offs, and how their choices lead to outcomes related to such things as fertility, work, migration, raising children, spending government grants, and the health and welfare of subsequent generations. What’s more, since families – both immediate and extended – are complex and ever-changing, the academics in this 50-year-old field do not lack for research topics. 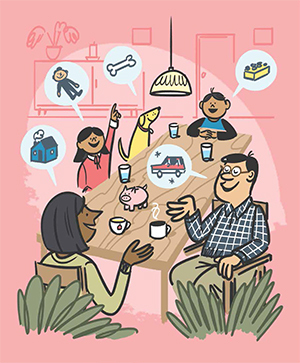 “Up until the mid-20th century, economists looked at the family simplistically,” says Shari Eli, an assistant professor in the department of economics at the University of Toronto. They viewed families as mere cogs in the wheel of larger economic forces. “We’d talk about a household demand for goods, but we didn’t really ask where that demand is coming from,” says Elisabeth Gugl, associate professor of economics at the University of Victoria. In the 1970s, Gary Becker, a University of Chicago economist, applied economic theory to relationships. He showed that couples marry to achieve comparative advantage, like nations engaging in trade, and they would divorce if they thought that offered better opportunities than staying together. He calculated how the number of children in a family impacted time use and investment in those kids. He synthesized this work in the seminal 1981 book, A Treatise on the Family. While Dr. Becker’s work was dismissed early on – the male-dominated field of economics did not consider whom you chose to marry or what women did with their time to be terribly important – by 1991 he’d earned a Nobel Prize in economics. “He looked into areas no one had looked before,” says Dr. Gugl. Dr. Becker had essentially blown microeconomics wide open, giving scholars permission to consider give-and-take patterns in all human actions. In fact, his ideas inspired the creation of other subdisciplines, including labour and health economics. His work came at a pivotal time. The West was seeing rapid social change, plus economics was adopting new methods. “There was a mathematization of the discipline,” says Miles Corak, a Canadian and professor of economics with the Graduate Center of City University of New York. “It became more technical and we got a toolkit.” As the field moved towards framing actions and effects as formulas, economists could actually measure human behaviour. “Becker was more the art and not the science. Many of his theories were flawed,” says Aloysius Siow, a professor of economics at U of T. Dr. Becker’s household economics theory cast the father, who held the economic power, as a benevolent dictator making choices to benefit everyone. (His influential, and amusingly named, rotten kid theorem showed that even if a naughty child tried to divert money for his own means, the dictator would balance it all out by giving more money to the other, innocent kids.) Meanwhile, Dr. Becker, like many economists of his time, assumed that family members acted rationally. Scholars began developing new theories that showed couples bargained, and sometimes did so inefficiently – they would waste family resources, or their decisions caused conflict. “This was a conceptual breakthrough,” says Canadian Shelly Lundberg, the Leonard Broom Professor of Demography at the University of California, Santa Barbara. In 1993, Dr. Lundberg developed the separate spheres model, which framed how couples would disagree but push on in an uncooperative state. (Later this was dubbed “harsh words and burnt toast.” We’ve all been there.) Early work in the field also developed increasingly reliable formulas showing how women given government money will spend it on children, while men will spend it on themselves. Within a few decades, the field had a range of valid foundational theories for mapping decision-making within families. Academics increasingly could investigate human actions and offer a concrete prediction for what would happen the next time around. In 1930, 60 percent of homes in the U.S. had either no electricity or were wired only for lighting. Thirty years later, almost everyone had power and multiple time-saving appliances. To find out how this dramatic technological change impacted the baby boom and women joining the workforce, Joshua Lewis, assistant professor in the department of economics at Université de Montréal, used the location of early power plants – since those who lived near them would get the power to their homes first – and correlated that with census data, home ownership stats, fertility, school records, time-use data and employment data. Of these 20th-century social shifts, which Dr. Lewis calls some of the “big questions” in family economics, electricity had a complex impact. Electricity reduced child mortality – electric stoves made for better air quality than coal-fired ones – but family size didn’t soar in this cohort. Nor did the mothers head out en masse for jobs, which was unexpected. “These women didn’t work less in the home. They tended to invest more in their kids,” says Dr. Lewis. However, the daughters who grew up in these early electrified homes were themselves more likely to work decades later. He theorized and developed a formula around these mothers’ increased time spent child-rearing – which entailed taking over daughters’ household chores – and how that led to different outcomes for daughters. Another big question: why did marriage rates decline starting in the 20th century? Dr. Siow of U of T, along with economist Eugene Choo, who’s now at Yale-NUS College (a liberal arts and sciences college in Singapore), created the Choo Siow marriage matching function to find out. The duo showed in a 2003 paper that marriage rates dropped in the 1970s and ’80s because marriage offered fewer gains. Legal abortion also played a role in the phenomenon. Meanwhile, U of T’s Dr. Eli and colleagues used long-term data, cross-referenced with other multiple data sources, to follow 80,000 mothers in the U.S. who applied to receive support through a mothers’ pension program, the first of which began in 1911. Such programs, according to a government bureau at the time, were intended to improve the conditions of “young children that have become dependent through the loss of the breadwinner” – i.e., the male of the household. When a family got the program for just three years, sons got more education and had better jobs and actually lived a full year longer than sons from families that had been rejected for the program. Dr. Eli concluded that the mothers didn’t just invest in their children, they often remarried, but made a wiser choice. “We found they married men who were healthier and from a higher status. The welfare allowed them to look [for a spouse] for longer, as their material needs were taken care of,” she says. Along with big questions about fertility and wealth – how many kids a family has and what resources they put into raising them – academics working in this field have been mining the importance of subtler influences on the family. For instance, Dr. Siow says he and Dr. Choo altered their marriage matching function to take into account the influence of peers. “Quebeckers are more likely to cohabitate because they like cohabitation, but also because other Quebeckers are cohabitating,” he says. Dr. Lundberg at UC Santa Barbara thinks this kind of influence will inform even more research in the future – she mentions a study done by another researcher that found fathers in Norway were more likely to take parental leave if their older brothers did so, too. “There are tons of researchers doing nuanced studies like this, asking why we behave as we do,” she says. Interestingly, researchers in this field are only now taking a closer look at fathers. Women have been the heavy focus in this field, which is the opposite in many disciplines, including mainstream economics. “I think fathers aren’t given enough credit and importance,” says Dr. Eli, who’s now researching fathers’ impact on the long-term well-being of families. Meanwhile, researchers like Dr. Ashraf of the London School of Economics believe there is much to discover about the influence that children have inside families. Since girls in Zambia often want to go to school but must convince their parents to grant them permission, she did a field study that taught daughters how to negotiate. Those who did the training had better educational outcomes three years later. Because many in this field need multiple, long-term data sets, researchers such as Dr. Eli and Dr. Lewis have focused their work on the U.S. However, over the last few years, Statistics Canada has begun offering controlled access to a growing trove of administrative data, including tax, welfare, education, health and pension records. While identities are protected, researchers can track the same individuals over multiple data sets. “In Canada, we’re on the cusp of having an amazing amount of data that is extremely rich,” says Dr. Corak. Marie Connolly, associate professor in the school of economics at Université du Québec à Montréal, says there are limits to how much you can find out about an individual using administrative data, but the sheer vastness of it is a boon to the field. Meanwhile, a project out of the University of Guelph plans to release a fully digitized version of Canadian census records from 1867 to 1921, which will include identifying information. The project is being funded by the Canada Foundation for Innovation and a number of public and private partners, including Ancestry.ca. Kris Inwood, a professor of economics and history at U of Guelph, says his group is preparing 32 million records for academic use. “When we have names, we can link to other sources,” he says. “With this amount of data, the questions we can ask are often the really important ones,” including research on income mobility and death rates over generations. Many of the academics doing this work also find their work gets referenced when governments ponder child-care policies and welfare programs. Dr. Lundberg says one of her studies was cited in an economics report to the president during the Obama administration. Dr. Corak says intergenerational cycles of poverty and the widening gap between rich and poor further draw policy-makers to this work. Issues such as the birth rate – too low here but still dangerously high in some developing nations – and the gender wage gap all can be better understood by family economists.